To cite Plecoptera Species File, see reference string at bottom of page. Several types of searches are available from the Search tab. Some data presented herein are based upon work supported by the National Science Foundation under Grant DEB 09–18805 ARRA. Any opinions, findings, and conclusions or recommendations expressed in this material are those of the author(s) and do not necessarily reflect the views of the National Science Foundation. 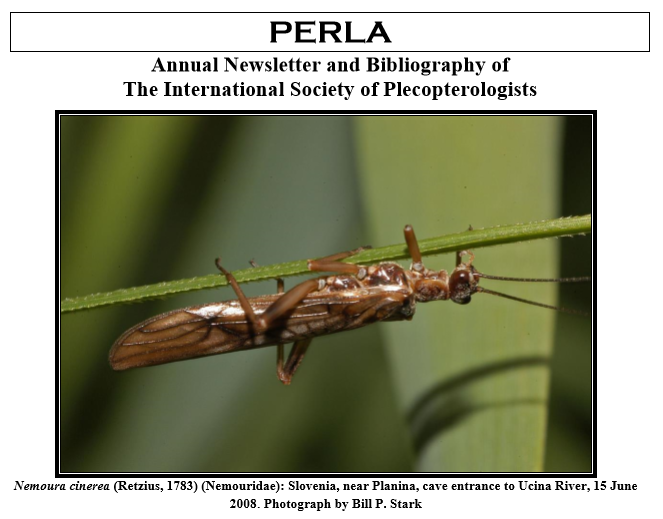 The Plecoptera Species File website includes valid names, their synonyms, bibliographic data, specimen data, images, sounds, and distributions for stoneflies of the world. To see information contained in the database, use the links across the top of the page. Click on Search to find a specific taxon or other kinds of information. Clicking on Taxa will make the order Plecoptera your current taxon unless you have previously moved to a different taxon in this session. Please send comments and questions about the database and its development to Ed DeWalt (send mail). When referencing this website, please use the following format: DeWalt, R. E., M. D. Maehr, U. Neu-Becker and G. Stueber. 2019. Plecoptera Species File Online. Version 5.0/5.0. [retrieval date]. <http://Plecoptera.SpeciesFile.org>. Use http://Plecoptera.SpeciesFile.org to bookmark this website.